Tuesday’s general election in Philadelphia saw a former civil rights attorney running on an anti-incarceration platform elected district attorney to the country’s fifth largest city. 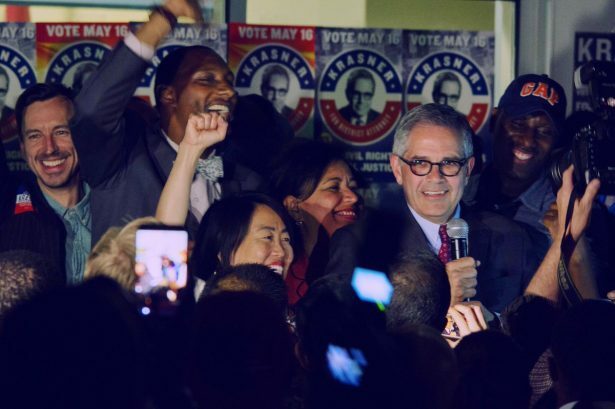 Larry Krasner, who defended Black Lives Matter activists and indicted police officers while in private practice, promised sweeping reforms and Philadelphia voters responded. In a city where registered Democrats outnumber Republicans seven to one, the fact that Krasner won might seem unsurprising. However, back in May, when the Democratic primary was in full swing, Krasner wasn’t the party favorite. Most other candidates, like Tariq El-Shabazz, were considered favorites because they towed a more moderate line and touted their experience as prosecutors. Then, during the general election, he was faced with pressure to moderate his proposals, and the battle continued to make sure that a message of systematic reform was front and center in the race. In order to shift the race to the left and hold Krasner accountable as he prepares to take office, a broad coalition of progressive groups put aside their differences to focus on winning. The leaders of this alliance are the people most impacted by the city’s justice system, including prisoners in Pennsylvania state prisons. Their efforts, which helped create the conditions for Krasner’s victory, are part of a long history of Pennsylvania’s incarcerated citizens changing public discourse. Over the past two decades, the HRC has sown the seeds of criminal justice reform in the city of Philadelphia and throughout the state of Pennsylvania. The HRC has also inspired the formation of several other prisoners’ human rights organizations in Philadelphia. Prisoners who were leaders in HRC joined the advisory boards of local and national organizations such as the American Friends Service Committee, Decarcerate PA, Families and Communities United and Reconstruction, Inc. They then encouraged their family members and loved ones to join community organizations as rank-and-file members to ensure their voices were heard. Prisoners at State Correctional Institution Graterford, in particular, organized a political action campaign in Philadelphia that saw their families and communities influence the 2015 Pennsylvania Supreme Court judicial elections, resulting in a clean-sweep of Democratic justices being elected to the state’s Supreme Court. Earlier this year, the community organizations’ spokespersons were able to contact the candidates and explain that SCI-Graterford prisoners are 5,000 in number and have an average of five family members who will vote for the candidate of their choice. That means a potential 25,000-strong voting bloc. That number of potential voters compelled El-Shabazz to campaign at SCI-Graterford on four occasions. Krasner also scheduled a campaign event at SCI-Graterford, but prison officials cancelled the event, claiming they had not been given enough notice. After the primary, Graterford prisoners were able to reschedule Krasner’s visit. Speaking to several hundred prisoners, he unequivocally adopted their proposed criminal justice reform agenda. As a result, according to leaders of organizations in the prison, Krasner earned the overwhelming support of the incarcerated men at SCI-Graterford. His impeccable record and reputation of being a civil rights attorney for the people of Philadelphia also made him the candidate of choice for multiple prisoners’ organizations, such as Right to Redemption (an organizing group focusing on ending life-without-parole sentencing, or what they call Death By Incarceration), the Latin American Cultural Exchange Organization (representing Latino lifers) and the Grey Panthers (representing elderly prisoners). That being said, support for Krasner wasn’t universal. El-Shabazz received the endorsement of Graterford’s NAACP group. That wasn’t enough, however, to overcome his ambiguous stance on the prisoners’ criminal justice reform agenda or his tainted reputation as a former criminal defense attorney and deputy district attorney. After discussing which candidate would best represent the collective interests of prisoners and their communities in society, Graterford prisoners reached a general consensus that Krasner would be their candidate of choice. 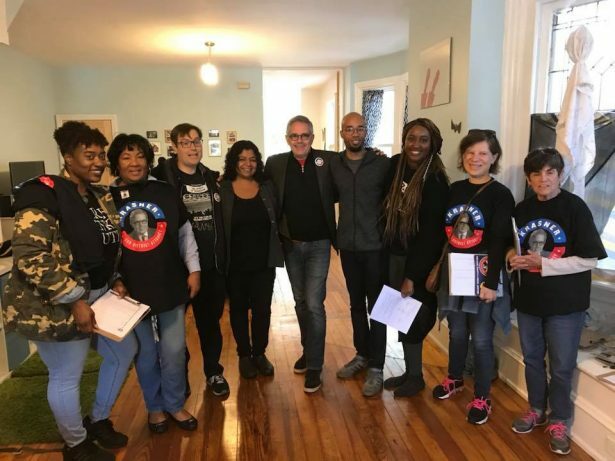 Prisoners supported Krasner’s candidacy with a robust political action campaign of voter education, voter registration, political forums, and get-out-the-vote drives directed towards their families, loved ones, friends and returned citizens. A year ago, high up in a 16th floor law office in downtown Philadelphia, a collection of community leaders gathered to discuss the upcoming district attorney race. Convened by Media Mobilizing Project, a local media justice organization, ACLU Pennsylvania, and Color of Change, the first meeting was a raucous affair. Donald Trump had just won the election. The current district attorney was under investigation. Organizers crowded on windowsills and along the walls argued over who would run, whose issues would take center stage, and what needed to happen. Like so many efforts, it could have died right there. But it didn’t. Held together by those convening organizations and a deep belief that they could all benefit by working together, the group — calling itself the Coalition for a Just DA — kept pushing, bringing in more groups and widening the table. Organizations flooded the city, coordinated door-knocking efforts, mobilized people who wouldn’t have otherwise voted, and hosted a large forum where candidates were grilled by people directly impacted by policing, incarceration and “crimmigration” (the intersection of immigration policy and the criminal legal system). The Coalition for a Just DA didn’t stop after the primary. When centrist Democrats tried to regain control of the race and quell the insurgency, coalition members pushed back. The city’s Democratic machine showed they were more interested in maintaining the status quo — essentially Republican candidate Beth Grossman’s platform — than in reform by quietly stepping back from the race. In meetings with insiders, the coalition learned that moderate Democrats from around the country were interested in helping Krasner if he won. 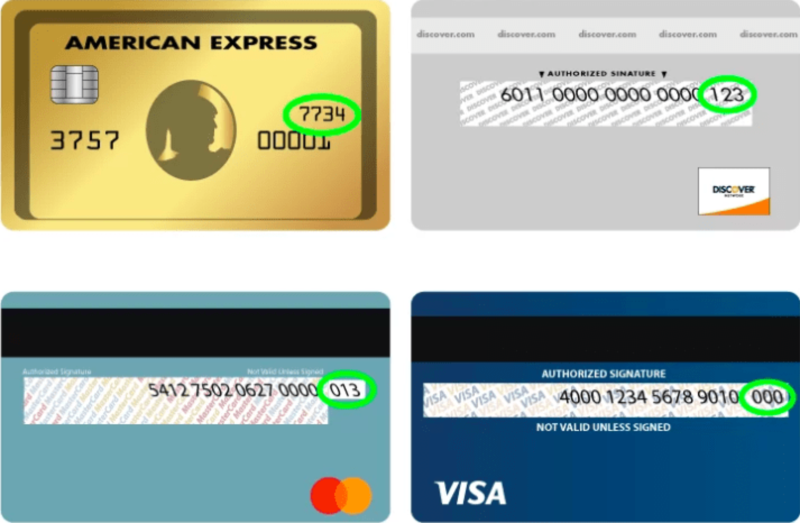 So, they responded by becoming more bold. Groups directly impacted by youth incarceration, the bail system, crimmigration, policing, Death By Incarceration sentences, and other issues got together and drafted in-depth policy proposals. Prisoners contributed directly to a number of these proposals. 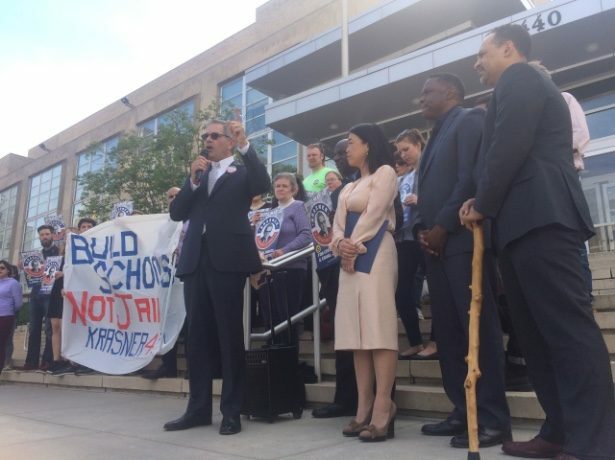 The coalition then articulated a set of demands for the first 100 days in office for the new district attorney and presented both candidates with a list of what could be done on day one. At the same time, moderates became more critical of the radical positions of some Krasner supporters. Instead of throwing other progressives under the bus for being “too radical” or “dangerous,” the coalition kept the focus on winning meaningful reforms. When the Philadelphia Inquirer backed Grossman, worried about looking too progressive, coalition members stepped up canvassing and organizing efforts, bringing in more community organizations. Politicians and political commentators generally operate within the range of ideas that have broad public support. Anything outside that range is generally considered politically impractical, or even impossible. The Tea Party and the so-called alt-right are textbook cases of movements widening the range of ideas. While many liberals continue to be shocked by racist statements made by President Trump or other members of the far right, neo-Nazis rally and advocate for genocide in public spaces. When it comes to policies around mass incarceration and policing, movements for justice and equality cannot be afraid to use our capacity to shift the conversation. A year ago, political leaders in Philadelphia would have told you that only very moderate criminal justice reform was possible. A report from the Philadelphia City Council from fall 2016 recommends a slight reduction in bail for a few nonviolent offenders. Today, the incoming district attorney advocates for the complete end of bail for nonviolent offenders. Earlier this year, and just weeks before he went to jail for corruption, former Philadelphia District Attorney Seth Williams said he would seek life sentences for a number of people sentenced to die in prison as juveniles. Throughout the campaign, Krasner publicly stated his support for HB 135, a bill in the Philadelphia House of Representatives that would end life without parole and make over 5,000 prisoners in Pennsylvania currently sentenced to die in prison eligible for parole after 15 years. This sea change in the district attorney’s office is just one part of the struggle to radically rethink policing, prisons and punishment. This shift in the range of what’s politically possible could not have happened without the many campaigns that came together to form the Coalition for a Just DA or the vision and organizing of Philadelphia’s politically-active prisoners. Prisoners mobilized a base — their family and friends — that is often disconnected and disenfranchised from politics, showing that winning isn’t necessarily predicated on co-opting centrists. It can also be done by organizing people who aren’t normally involved in the election process to vote as a bloc. That’s why last night 147,666 people voted for Krasner, as compared to just 89,238 votes for the Democratic candidate in 2013. This campaign can be a blueprint for other prisoners, their families and community groups to wage a grassroots radical criminal justice reform campaign. 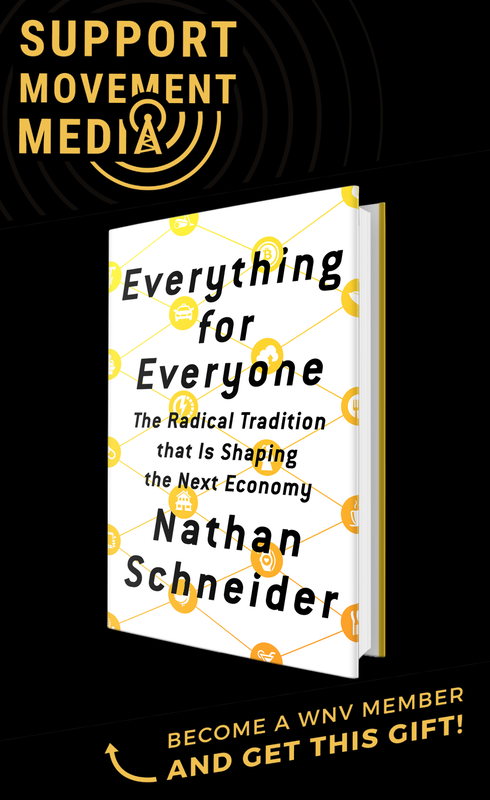 By organizing alongside prisoners, recognizing the possibilities of mobilizing new constituencies, and keeping the focus on building inclusive coalitions and winning real change, radicals can get practical and win. Kerry "Shakaboona" Marshall, has served 29 years as a Child-Life Sentenced Prisoner in Pennsylvania, is Co-Founder of the Human Rights Coalition (HRC) in Philly, is Co-Founder & Editor of The Movement human rights news magazine, is a Human Rights Activist/ Organizer/ Leader, is a Correspondent for Prison Radio, and is currently awaiting Resentencing as a Child-Lifer to eventually be paroled to Freedom. John Bergen serves as Associate Pastor at Germantown Mennonite Church in Philadelphia and is a member of the Coalition to Abolish Death By Incarceration, a campaign to end life without parole sentencing in Pennsylvania. It’s odd that this article doesn’t mention Becky Bond or Real Justice PAC or Knock Every Door. Charles – Thanks for lifting this up! There were a lot of stories that we didn’t/couldn’t tell in this single piece. Becky Bond and those organizations did really crucial and amazing work. The work that immigrant justice groups did to lay the groundwork for this win is huge, and the work by young people unjustly incarcerated as adults has also inspired me. We definitely just told one piece of the story! The strongest win yet for the no longer obscure Restorative Justice movement. Indeed the debate is now widened to show that alternatives to incarceration fight criminal actions while preserving the humanity of the criminal offender. May leaders now feel enabled to work for this policy all around our over-incarcerated nation. Wow you guys have got something , reading this article the light has just switched on. Here in the deep South in Tennessee where this state is unapologetically red. A coalition of the disenfranchised people can be formed. Ms.Flanagan I’m in an men’s organization and is interested in voter education/registration would like to get some pointers on organizing voter registration drives starting January 2018. The Soros donation of several hundred thousand dollars, and underwriting of a number of “community” organizations would seem to bear mention. With all respect to Mr. Krassner, who is a mensch… perhaps donating to candidates is a better use of the imperial liberals billions… Because controlling “media” and discussion through “funding” and the creation of “leadership” vetted by the likes of Soros who laid waste to Eastern Europe with his anti-socialist, pro-capitalist and “civil society” demagoguery has turned almost the entire region over the “social nationalists” — who have now turned on him. Our problem is political, not policy. So, all respect to Mr. Krassner and the many people who were able to get a decent person into this important position. But let us not be naive. Or not discuss how “citizens united” works when anti-socialist, pro-NATO billionaires dictate who our leaders are, who matters… and who don’t. Put another way, “Black Lives Matter” didn’t rise up in Ferguson. The people did. And then the “foundations” HIRED who THEY think should do nothing but talk about identity and how they deserve to get paid (while Ferguson and Baltimore and every place the non-rich, non-ivy league educated, non-Ford/OSF “foundations” decree DO NOT MATTER continue to live in a world of hurt.